Living Life Artfully features my artwork, ideas, inspiration, and humor. If this newsletter was forwarded to you, subscribe here. Newsletter subscribers receive free shipping on website orders up to $500. Please spread the word. Thanks! There’s nothing like meandering through a scenic park on a gorgeous autumn day to make me feel fully alive. I find parks inspiring, invigorating and restorative. Plus, they really get my creative juices flowing. Connecting with nature has always had that effect on me. Having hiked, walked, biked, skated, kayaked or participated in bird watching at about 75 parks on both coasts, I've been inspired creatively, on both conscious and subconscious levels. Some of my favorite New Jersey parks include Ramapo Reservation, Mahwah; James A. McFaul Environmental Center, Wyckoff; Saddle River County Park, Bergen County; The Celery Farm, Allendale; and Jersey's newest crown jewel, Duke Farms in Hillsborough. To discover parks in New Jersey, check out NJ Urban Forest. This blog offers detailed trail information and numerous photos about New Jersey and forested parks in the surrounding area. Also, the Oh Ranger! park finder app is excellent. It matches the activities you love with parks located anywhere in the country. Plus, it’s free! Thank you Seattle and B9 Architects for exhibiting ten of my paintings through December 4th, 2013. Sometimes it's hard to part with my "babies," but my two favorites, "No Place Like Home" (left) and "Love Shack" (middle), are going to wonderful homes. There is a sale pending on "Flowertopia," 24"x24", $550 (right), but if you're interested, let me know and I will check to see if it's still available. I'm also looking forward to starting on my large and unusually sized commission soon. It will be about 16" H x 47" W. Questions about a commission? Email me. Ready for a Good Chuckle? This stylish pup is rockin' the orange braids. 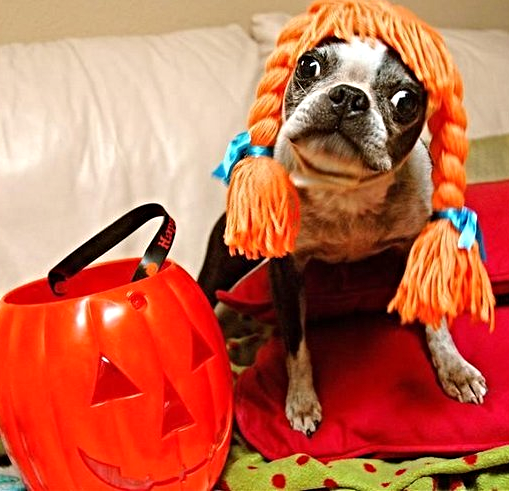 Check out more impressive pet costumes on the Daily Dawdle. Disclaimer: please dress your beast responsibly. Problem: Don't have the time or skills to create a professionally designed and written email newsletter? Solution: Hire me! In addition to being an award-winning artist, I'm also a Constant Contact All Star Award Winner for email marketing. Visit my business writing website for more information. Copyright © 2013 Christine Auda, All rights reserved.